The Plot: Seven years ago, ESU professor Dr. Fields is murdered and his scientific notes go missing. Today, Peter Parker and underclassman Neil Aiken hope to work on a research project based on Dr. Fields’ work. The project is soon attacked by the mysterious Crown, who wants Dr. Fields’ research. As Spider-Man, Peter tries to protect the students from Crown. He’s joined by a new hero, SHOC, who has a past with Crown. With SHOC’s help, Crown and his henchmen are sent to another dimension. The Subplots: Betty Brant is angry with Flash Thompson for an unrevealed reason. While registering for classes at ESU, Mary Jane meets Jill Stacy, the cousin of Gwen. The implication is that Crown killed Dr. Fields (and possibly his wife) in the story’s opening flashback. They leave behind a young child, who would now be in his late teens. The SHOC who fights Crown is apparently the second SHOC, a departure from the grim, taciturn SHOC that Crown remembers. SHOC refuses to give Spider-Man any details on his identity or Crown’s plot, but points him in the direction of Hydra. Crown claims that absorbing energy generated by the experiment will make him a god. SHOC is somehow able to use the energy to send Crown and his henchmen to (presumably) another dimension. I Love the ‘90s: Spider-Man references both Sally Jesse Raphael and Rosie O’Donnell’s talk shows in his course of terrible joke making. “Huh?” Moment: Spider-Man is miraculously able to discern that “SHOC” is an acronym just by hearing people say his name. He also knows the specific spelling of “SHOC.” The only way this could possibly work is if these characters are actually spelling out the letters S.H.O.C. when saying the character’s name. Creative Differences: Jill Stacy was originally supposed to make her official debut a few issues earlier, according to “Life of Reilly.” She was intended to be a police officer, of all things, and there even exists some penciled pages of her in uniform that were never used. Review: I don’t want anyone to think that I’m just picking on the same creators over and over again, but...I guess Howard Mackie keeps coming up, huh? After writing something as unreadable as X-Factor for so long, I couldn’t justify ever buying anything written by Mackie again, so I avoided these issues for years. The fact that Marvel not only kept him around the X-Office, but the Spider-Titles as well, just astonished me. Moreover, they paired him with John Romita, Jr.! 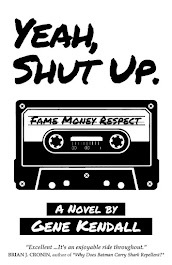 Why put one of your worst writers and one of your best artists on the same book? It made no sense to me. Overlooking the bad jokes and poor syntax, this could charitably be viewed as a decent start for a new storyline. The details are so vague you can’t say that SHOC’s story is horrible just yet, so there's still potential for this to go somewhere. SHOC’s design, which isn’t too far away from ROM’s look, isn’t a homerun, but it isn’t hideous. And if Mackie is setting up the idea that new student Neil Aiken is SHOC’s secret identity, he’s seeded some clues that aren’t painfully obvious…just regular obvious. You might even be fooled into believing that this Jill Stacy subplot has potential. Under most writers, it probably would, but for some reason the Stacys are adopted by this book and usually left as bit players in the other Spider-Man titles. Why Howard Mackie took on the Stacy family when he’s A) by far the worst when it comes to constructing personalities and writing natural dialogue, and B) not noticeably interested in any aspect of these characters, is a mystery. The Stacys languish around the books for over a year, apparently deemed “interesting” by Marvel simply due to their last name, and accomplish absolutely nothing. And even when dwindling sales force the titles into a relaunch, Jill and her dad get dragged along into more hopeless storylines. 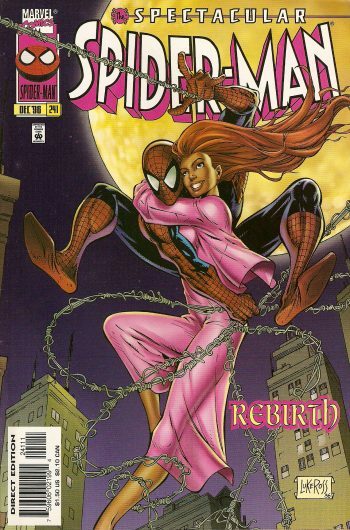 Jill even becomes (ugh) a romantic rival for MJ after Marvel decides to reintroduce “girl troubles” into the books. Unfortunately, the seeds for some truly awful comics are in this issue. That's the future, though. Right now, this is at least readable, even if the dialogue is occasionally painful. Deluge Part Three - Inundated! 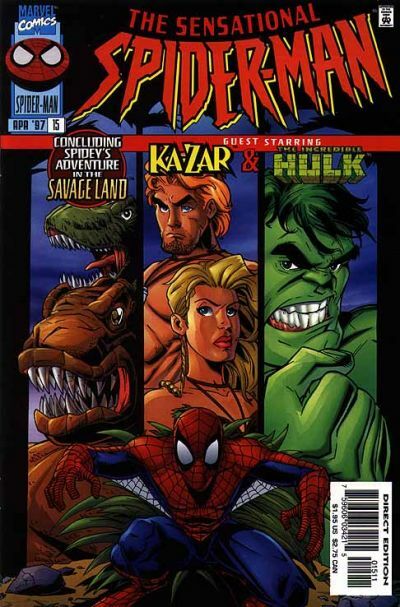 The Plot: Spider-Man convinces Stegron that Ka-Zar is fighting to protect the Savage Land, leading him to command his dinosaurs to help. The Hulk and Chtylok suddenly enter, engaged in their days-old battle. Stegron sends his dinosaurs to incapacitate Chtylok, while Ka-Zar rushes off to confront Dr. Roth. He reveals to SHIELD Roth’s plan to flood the Savage Land, which would make the area legally available for oil drilling. Later, after Roxxon disavows Dr. Roth, he detonates charges on the dams and floods the area. Luckily, the water disappears in the crater created by Hulk and Chtylok’s fight. Ka-Zar allows Dr. Roth to escape, knowing that Chtylok will kill him in the wild. Web of Continuity: It’s possible this issue was meant to justify why the Hulk is in the Savage Land at the beginning of Incredible Hulk #454. I Love the ‘90s: The opening narrative captions still describe dinosaurs as reptiles, which is a theory that I believe has been replaced with the belief that dinosaurs were closer to birds than lizards. Review: The pieces fall into place for the final chapter, with the previous issue’s prophesy that Chtylok would one day save the Savage Land actually coming true in a cute way. One plot element that doesn’t work, however, is the “plan” that Spider-Man spontaneously develops and conveniently explains off-panel (the comic book equivalent of the old Hanna-Barbara “whisper whisper whisper” into someone’s ear). Apparently his plan is to ask Hulk and Stegron to help him destroy all of the heating units Roxxon’s placed all along the Savage Land, but…what kind of a plan is that? Of course that’s what they’re going to do next. And their actions are pointless anyway, since Dr. Roth detonates the dams out of spite and floods the area they were trying to save. Ka-Zar intimates that this all a part of Spider-Man’s plan (even though Spider-Man is shocked when the dams blow), but how is it a “plan” that a giant crater would collect rushing water? What did Spider-Man have to do with any of this? The screw-up isn’t too obvious until you stop and think about it, but it is annoying. The light-hearted ending, involving the death of the villain, also feels at odds with the tone of the rest of the arc. Would Dezago treat, say, the Shocker’s death as a joke? Regardless, the majority of this arc has been fun, and it’s obvious Dezago and Wieringo work really well together. Even if the stories aren’t airtight, they’re pretty entertaining and always suitable for Wieringo’s art style. I don’t know if Marvel would ever release a hardcover collection of this run, but any fan of this style of superhero cartooning should at least search out the back issues. 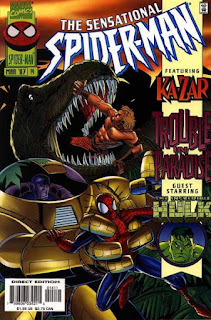 The Plot: A Fall People elder explains the legend of Chtylok to Ka-Zar and Spider-Man. After the tribe is again moved out of harm’s way, Ka-Zar shows Spider-Man one of Roxxon’s relay units. Spider-Man realizes that the unit is actually increasing the temperature, and acting as an oil rig. Ka-Zar races off to confront the Roxxon employees, but is ambushed by Roxxon guards in armored suits. Spider-Man tries to help, but their fight is interrupted by Stegron, who emerges with an army of dinosaurs under his command. The Subplot: The Hulk investigates the exodus of beasts from Monster Island and discovers Chtylok. Their fight takes them to the tunnels underneath Monster Island. *See _________ For Details: Stegron was frozen outside of the Savage Land in Thunderstrike #20.
Review: Unlike the rest of the internet, I don’t have an ironic appreciation of Stegron. I’ve never cared for the design, and can’t think of any stories featuring Stegron as the main villain that were particularly good. Stegron in small doses is fine, though, and luckily this story treats him as just another one of the crazy menaces you might run into in the Savage Land. And while this issue covers much of the same ground as the previous issue, there is a genuinely touching moment during the Fall People evacuation scene. It’s easy to dismiss the characters as generic native warrior clichés and to play the older members of the tribe as a joke, but Dezago does a great job in merely one page detailing just how hard it can be for anyone to leave their home behind. As for the art, it’s another issue of Wieringo drawing dinosaurs and giant Marvel monsters, so it’s great. I will point out, however, that this issue is one of the more egregious examples of Wieringo drawing Spider-Man’s eyes and head inconsistently. It probably shouldn't bother me as much as it does, but I think it's a major reason why it took me a while to appreciate Wieringo's Spider-Man. The Subplots: Stegron and the Chtylok are both released from captivity by the melting ice surrounding the Savage Land. Chtylok goes on to terrorize Monster Island. Meanwhile, Spider-Man helps Ka-Zar and Shanna rescue a girl with malaria. Shanna complains that a tribal shaman has ostracized the girl and turned the Fall People against Shanna’s medical training. 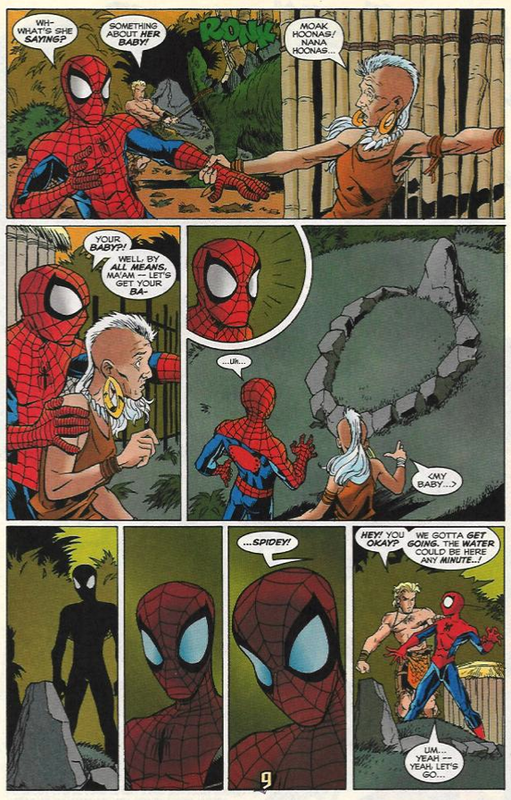 Web of Continuity: Jonah Jameson’s rationale for sending Peter to the Savage Land is that he’s one of the few members of the media that has been there before. 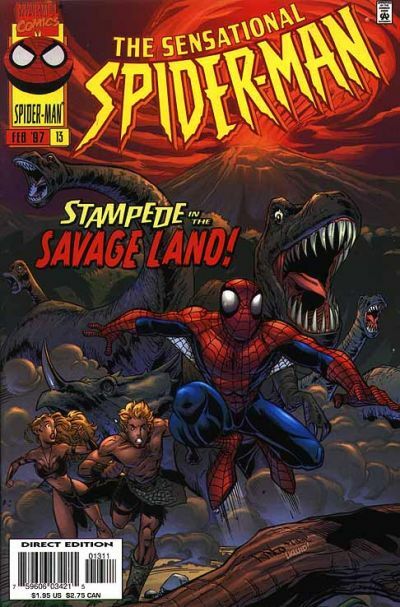 Spider-Man’s first trip to the Savage Land began in Amazing Spider-Man #101. “Huh?” Moment: The implication in this story is that Chtylok is awakened by water created by the melting ice caps near the Savage Land. He then somehow emerges on Monster Island, in the Bermuda Triangle. I vaguely recall stories about tunnels beneath the Earth that allow people to travel great distances in the Marvel Universe. I assume Chtylok used one of them? Commercial Break: An insert for Radio Shack’s new line of remote controlled cars appears in the middle of the comic, interrupting a double-page spread. Review: According to Todd Dezago, Stan Lee told the assembled group of Spider-Man writers that he really liked this storyline during one of his tours of Marvel’s offices in the late ‘90s. And it’s not hard to see the appeal -- Mike Wieringo. Dinosaurs. Chtylok. It’s bright, fun, unpretentious superhero comics. I would say that making Roxxon the evil corporate villains yet again is a boring cliché, but this arc is all about traditional Marvel fun, and “traditional Marvel” states that Roxxon must always be the baddies. (You would think Tony Stark would’ve simply bought them out and brought in new management by now, though.) I doubt Stan Lee had any sway over this decision, but this story arc must’ve been fairly popular within Marvel’s offices, since it became one of the few Marvel trade paperbacks to be released during this era. 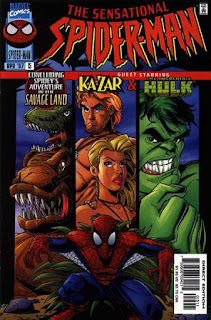 Aside from giving Spider-Man a break from his traditional setting, and giving Mike Wieringo cool things to draw, the story also serves as one of Marvel’s attempts to set up Ka-Zar’s new on-going series. 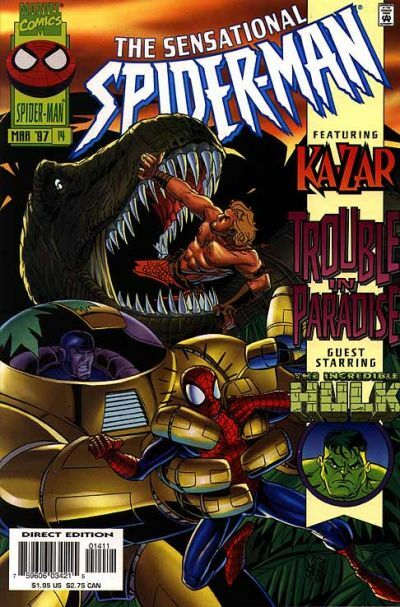 Ka-Zar went from occasionally appearing once every three years in books like X-Men Unlimited to showing up all over Marvel’s line in late 1996. And his new book, by Mark Waid and Andy Kubert, was legitimately good. It’s the type of slightly sophisticated and slightly retro superhero comic that Marvel doesn’t get enough credit for publishing during these days. And, because the internet loved it, it was fated to die a quick death. In fact, I think it died out just as the Dezago/Wieringo days of Sensational drew to an end, reminding me that “fun” usually doesn’t last long in modern comics. The Plot: The Trapster brutalizes two mob strongmen who harassed him in the past. The next day, the Daily Bugle reports that Spider-Man was responsible. 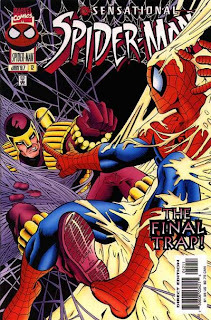 Incensed that Spider-Man received the credit, Trapster decides to bolster his reputation by killing Spider-Man. After leaving a trail through the city, Trapster eventually catches Spider-Man in a trap. When he finally escapes, Trapster is gone. The Subplots: J. Jonah Jameson tells Peter Parker he should focus on more serious stories, such as global warming. He announces that he’s sending Peter to the Savage Land to photograph the impact of melting glaciers on its environment. *See _________ For Details: Trapster apparently had an encounter with the same two hoods in Silver Sable #26. He claims he had to feign weakness in front of Sandman, which I’m assuming ties in somehow with their past together in the Frightful Four. I Love the ‘90s: Trapster declares he’s going to have the biggest comeback since John Travolta. Later, Jonah Jameson blames ozone depletion above the South Pole for global warming in the Savage Land. I haven't heard anyone blame the hole in the ozone layer on anything in years. “Huh?” Moment: Peter Parker is bizarrely given orange colored hair throughout the issue. Review: This reads as a typical inventory story, except that 1) the final page leads directly into the next issue, and 2) the idea of the Trapster’s glue being mistaken for Spider-Man’s webbing will turn up again months later in the “Spider-Hunt” and “Identity Crisis” crossovers. As Sensational’s first issue in the post-clone, please-stop-hating-us, Wizard era of Spider-Man, it’s a bomb. There’s no strong gimmick, none of the jokes are that great, and Peter Parker is given nothing to do except get yelled at by Jonah Jameson. But the most egregious offender is the art. This is wretched stuff; an unsightly mix of bad manga clones and bad Jim Lee clones. Josh Hood’s Spider-Man occasionally looks okay (even if the eyes are always excessively big), but his human figures are just awful caricatures that are painfully distracting. One of the worst aspects of the post-clone era is the multitude of subpar fill-in artists. There is some legitimately ugly stuff being published between 1996 and 1998, and that seems inexcusable when you consider that everyone from Ron Frenz to ChrisCross was probably available to do a fill-in. The Plot: Peter arrives in Central Park to photograph a street prophet, not realizing he’s the mutant X-Man. X-Man recognizes Peter’s secret identity and asks to speak to Peter privately. The two bond over stories about their past. Meanwhile, El Uno escapes from the hospital. He’s stalked by Delilah, who eventually kills him by slamming his body into a gasoline tanker. 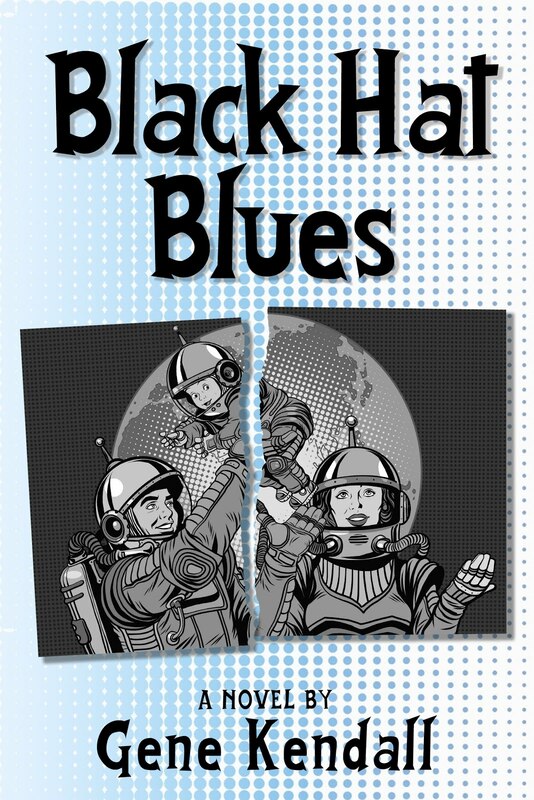 Later, El Uno’s head is mailed to the Black Tarantula. The Subplots: Peter wants to buy an expensive pair of boots for MJ’s Christmas present, but can’t afford them. Luckily, he makes enough money photographing the hole El Uno left in the hospital to buy the boots. Later, after X-Man joins Peter for the Parkers’ Christmas dinner, he gives Peter a psychic conversation with Aunt May in his dreams. She absolves him for any guilt he feels over losing the baby. I Love the ‘90s: The Daily Bugle contacts Peter through a beeper. Review: Ah, yes. 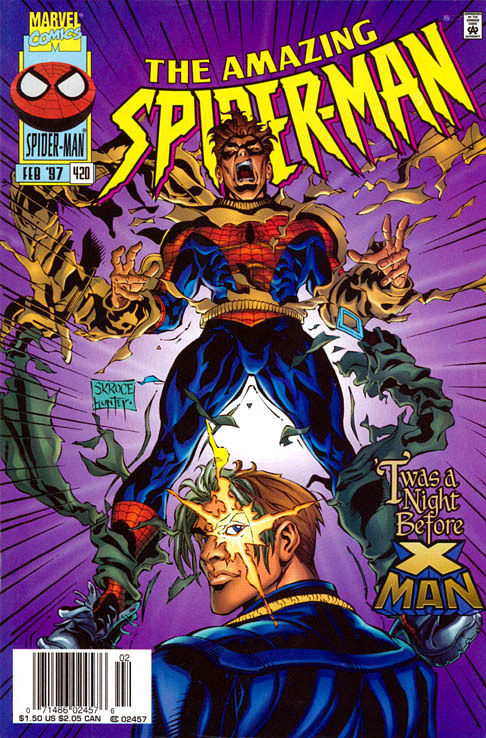 Peter Parker and X-Man were supposed to be great friends in the late ‘90s. I have absolutely no idea what the thinking behind this move was. Okay, I understand that Bob Harras wanted to make the Marvel Universe more cohesive and have the various corners of the MU interact more often, and it’s possible that someone felt the need to have Steve Skroce draw X-Man again. But, seriously, who would want to be friends with an infamous snot like X-Man? The only way DeFalco can make it work is by virtually ignoring all of Nate Grey’s established characterization (X-Man is the one who actually suggests skipping the gratuitous fight!) and just presenting him as a slightly naive teenager who doesn’t know how to responsibly use his power. I wonder if Spider-Man has any words than can help him out? DeFalco’s making the best of what he’s been given, and the result works out okay. Ignoring Peter’s odd decision to cover a psychic in the first place (even if he were skeptical, I imagine Peter’s protective enough of his secret identity to just avoid telepaths), the Spider-Man/X-Man scenes are decent enough. Since this is a Christmas story, DeFalco’s stuck in the odd position of writing the Parkers’ first Christmas since the miscarriage, and presumably losing Aunt May, yet adhering to Marvel’s decision not to dwell on the events of the past few years of continuity. The story doesn’t get into any serious exploration of what Peter must be feeling, but instead works in a few references to him seeing a therapist and still feeling guilty. Guilt that’s apparently magically relieved by this issue’s guest star. I can see why many readers would view this as a cheat, but I think DeFalco narrowly walks the line. We’re not getting the pages of psychological torment that J. M. DeMatteis might’ve provided during his first Spectacular Spider-Man stint, but DeFalco is working in hints of what Peter’s experiencing along the edges of the very mainstream superhero story he’s telling. 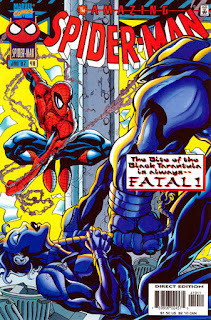 Speaking of which, there isn’t much to say about the Black Tarantula storyline. Two underworld characters we barely know anything about try to kill each other. One succeeds. Steve Skroce gets to draw another giant explosion. It’s not great, but it’s obviously there to just nudge that plot forward and give the main story something to cut away to. The Plot: Ben Urich learns of an emerald deal between the Rose and an unknown crimelord known as the Black Tarantula. During the meeting, Black Tarantula’s emissary ambushes Rose’s representative, Delilah. The bomb Delilah brought for protection goes off, forcing Spider-Man to flee with Ben Urich, and leave his camera behind. The Subplots: MJ paints over baby May’s room. Aunt Anna tells MJ that she’s taking college night courses, which inspires her to consider college. Peter also mentions his desire to finish his Master’s Degree. 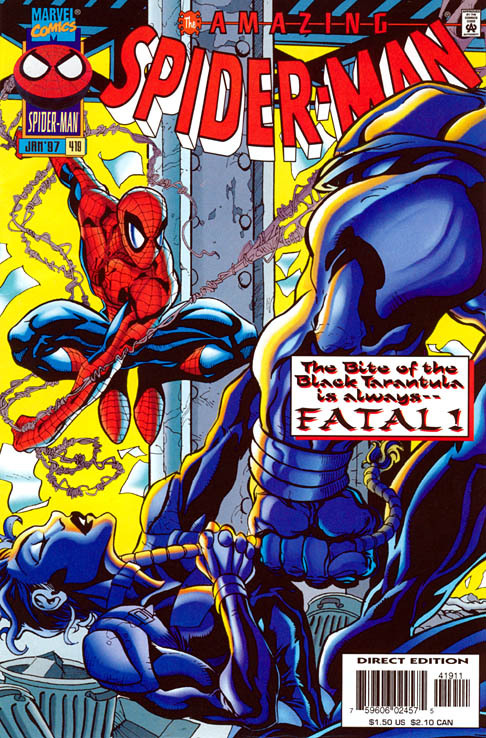 According to the Chronology Project, this issue (and around a dozen other comics featuring Spider-Man) takes place in-between the pages of Sensational Spider-Man #13. Presumably, they’re saying Spider-Man had numerous adventures right before he left on his flight to the Savage Land. 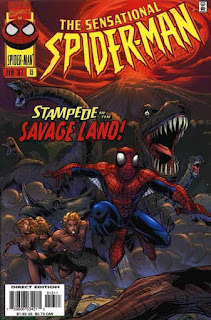 Since Sensational Spider-Man #12 ends with Peter getting his assignment to go to the Savage Land, I consider SSM #12-14 to be one complete arc, so I’m not going to be inserting other issues in-between this storyline when writing the reviews. Black Tarantula appears in shadow at the issue’s opening, speaking to his diminutive assistant Chesbro. The large man representing Black Tarantula, who Spider-Man initially assumes is Black Tarantula, is El Uno. Rose's top assassin, Delilah, is given unusually flamboyant fonts by Comicraft on seemingly arbitrary words. One of Ben Urich’s informants tells him that Black Tarantula is a cold-blooded killer, and that he’s recently come out of hiding after something happened to his wife and children. Peter complains that Aunt May’s old home only has one bathroom. That seems highly unlikely given that it’s a two-story house. And how did all of May’s boarders share one bathroom? *See _________ For Details: Fortunato consolidated much of the New York underworld in Spider-Man #74. Robbie Robertson mentions Graydon Creed’s assassination, which occurred in the truly classic X-Factor #130. Spectacular Spider-Man #241 (not Sensational, as the footnote reads) featured MJ’s return to baby May’s room. Review: Tom DeFalco has stated that he isn’t too thrilled with his late ‘90s return to Amazing Spider-Man. I read this run once after the 40th anniversary Amazing Spider-Man CD-ROM collection was released, and have to admit that the bulk of the issues are underwhelming. The quality probably would’ve been helped if Steve Skroce had remained as artist, but he’s fated to become the least “regular” artist in the history of this book. This specific issue, however, doesn’t foreshadow the mediocrity to come. It’s actually a nice little setup story that efficiently puts the pieces in place for DeFalco’s new direction. I’m not sure if all of these hints are paid off (like the unusual amount of emphasis placed on a photo of MJ’s maternity doctor when Peter walks through the Daily Bugle), but it reads as a promising start. And for fans of this era of Spider-Man, who had to suffer through one ridiculous plot twist and strained status quo after another for over two years, it was probably comforting to read a simple story about Peter and MJ dealing with real life issues, Spider-Man taking photos for the Daily Bugle, and new mob bosses invading New York. It’s also a decent looking comic, although I recognize that some fans have issues with Steve Skroce’s faces. For some reason he can’t seem to give MJ a facial expression outside of “annoyed cheerleader,” which doesn’t match DeFalco’s dialogue at all, but I have no problem with the rest of the civilian cast. And his Spider-Man is very good. I think Mike Wieringo will go on to develop the best Spider-Man from this era, but Skroce’s is already very consistent and appropriately Ditko and McFarlane influenced. The very dark shade of red Bob Sharen is using on the costume also works well; I think we’re only now getting to the point where colorists are free to do more than just basic colors on the costume. Skroce and LaRosa are emphasizing the dark areas of Spider-Man’s costume, so going for a darker red works perfectly. Honestly, in retrospect, this reads as if it should’ve been the start of a solid run. The Plot: Spider-Man swings through the city, reflecting on the second chance he’s been given. He stops by J. Jonah Jameson’s office and advises him not to work so hard. Meanwhile, the Chameleon retreats into insanity after learning he’s been scheduled to leave Ravencroft for federal custody. Later that night, he wakes in Ravencroft’s basement and sees Dr. Ashley Kafka. She reveals she isn’t ready to remand him to the authorities. The Subplots: Mad Jack, a new incarnation of obscure villain Jack O’Lantern, spies on Jameson’s office. Meanwhile, MJ discusses losing the baby with her aunt Anna. Later, Peter takes MJ web-slinging and they watch the sunrise together. Since the previous issue, Ben Reilly has been revealed as the clone…and killed. (By a resurrected Norman Osborn, no less.) The Parkers’ daughter has also had a vague death scene, although the books will hint for months that the baby is still alive and in Osborn’s possession. Also, Aunt Anna has apparently moved into Aunt May’s old home with Peter and MJ. Peter promises MJ that they’ll move out of Aunt May’s old house soon. I think this idea is totally dropped until the Mackie/Byrne relaunch that happens almost two years later. Miscellaneous Note: Marvel used “Revelations” as an excuse to debut new Spider-Man logos, which ran through most of the titles. It wasn’t long, I believe just one or two issues in some cases, before the books reverted to the ‘90s “spikey” logo, however. Oddly enough, this logo design did resurface over ten years later on the Spectacular Spider-Man animated series. Review: I’ve mentioned before that I am not a fan of the post-Clone Saga era of Spider-Man, and was actually kind of surprised to discover that this period of the titles has its supporters. This was largely an ignorant opinion, I admit, gleaned from a handful of comics from late 1996 to early 1997. 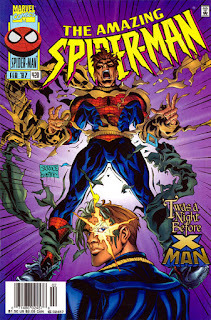 I tried a few issues of Amazing and Spectacular, an issue or two of Sensational, and steered clear of Spider-Man after being burned so badly by Howard Mackie on X-Factor. Over the years, I’ve compiled most of the books from this era, and I have to acknowledge that my initial opinion of the books was mostly wrong. Mostly. 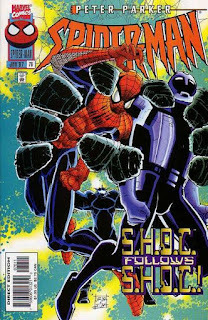 There is absolutely some good stuff here, and since this remains a largely overlooked period in the character’s history, I’ve decided to expand my Sensational reviews to include the rest of the Spider-canon until we get to the 1998 relaunch. After that...no. I'm not touching Chapter One, or The Next Chapter, as the present-day books have been retroactively labeled. No. Of the four monthly Spider-Man titles, the one written by J. M. DeMatteis would seem to be the obvious contender for the best of the pack. And it usually is, even though he’s oddly matched with Luke Ross on the book. This issue, J. M. DeMatteis takes the order the writers have been given (Peter and MJ must move on), and makes this a story about…moving on. You get all of the DeMatteis classics: silent panels, repeating images, introspective narration, and touching moments between Peter and MJ. I say that Luke Ross is an odd match if only because his style is, out of all of the artists on the books at the time, the least reminiscent of DeMatteis’ traditional Spider-partner, Sal Buscema; so seeing pages that are just begging to be Buscema pages drawn by someone with a polar-opposite style is a little disconcerting. Still, Ross doesn’t stand in the way of the emotion of the story, and as unpleasant as the prospect of a “Spider-Man and wife deal with miscarriage” story could be, this is as unobjectionable a delivery as you’re going to get. Regarding the superhero storylines, I think the reintroduction of Jack O’Lantern in a new form is a solid idea, even though time will show this is not one of comics’ greatest mysteries. Regarding Ashley Kafka and the Chameleon, I don’t care for the mentally unstable Chameleon, nor do I find Ashley Kafka as sympathetic as DeMatteis seems to. She’s certainly more tolerable when written by DeMatteis, but her actions in this storyline will make her even more incompetent, and frustrating, than we’ve ever seen her before. Luke Ross is coming off a series of mediocre fill-ins for the X-office at this point, and given that his major deficit is his inability to draw convincing human features (especially his females, with their weird cat faces and tiny noses), he doesn’t seem like an obvious choice to draw a book that relies heavily on a supporting cast. To his credit, this issue shows that he’s come a long way from those X-Man fill-ins. His human characters have an attractive, cartoony style that rivals what McFarlane was doing on his best days. In fact, Ross is clearly far ahead of McFarlane’s early work; it took McFarlane a few years to work his style into the book so well. And Ross’ interpretation of Spider-Man in costume is also hard to dismiss. That opening splash page of the character gazing over the edge of a roof is powerful (I’ve noticed that it still shows up in some of Marvel’s merchandising). So, perhaps not the greatest beginning of a brand new direction, but the issue accomplishes what it needs to. Peter and MJ's decision to move on feels organic, even if it was an editorial directive, and the title’s in a position to go forward without any clone baggage. This is the only quiet, introspective issue to follow the deaths of Ben and baby May, and it’s clear the story was assigned to the proper writer. And even if the art is spotty in places, Luke Ross produces some McFarlane-style Spidey that rivals even McFarlane’s better work. Now, can any of the other titles match Spectacular in their post-clone first issues? A 1993 commercial for the toy line based on the FOX cartoon. Summary: The Trapster is unable to find work while on parole, until he meets TV infomercial mogul Morrie through the internet. Adopting a new identity, he moves to Los Angeles to create adhesive devices, and over the months, becomes friends with Morrie and his assistant Kim. When he’s pressured into appearing on an infomercial to sell one of his inventions, the Wizard recognizes him. After getting into contact with him, the Trapster is convinced that the Wizard will blow his new identity and he’ll be arrested again. Panic-stricken, he holds an infomercial audience hostage and threatens to commit suicide. Kim talks him out of it, and professes her love, shortly before US Agent arrives and arrests him. Unexpectedly, the Trapster’s earnest speech makes him a star, which infuriates the Wizard. The Wizard and the Trapster were teammates in the Frightful Four. The Wizard has been arrested for kidnapping Silver Sable in-between the other stories in this collection. US Agent is described as an employee of Stark International, following the dissolution of Force Works. The author seems to be under the impression that the Marvel Universe is much older than any of the comics acknowledged at the time. The Wizard says he’s been following the wrong path (during an insincere press conference) for twenty years, and later the Trapster claims he’s been a supervillain for half his life. Not long after this book was published, Marvel released the Lost Generation miniseries, which was based on the premise that the Marvel Universe began only seven years ago! Not Approved By The Comics Code Authority: Trapster casually tosses off “goddamn” three times in the story. I Love the '90s: The Trapster is described as the hottest “victim of circumstance” since Rodney King, and the Oprah and Ila May (who?) talk shows cover his story. Review: I don’t quite understand the reasoning that gives the longest story in the anthology (thirty-eight pages!) to the Trapster, a character who’s only been defined by his joke status for around thirty years now. (Are there any Trapster stories now that don’t hinge on him being a loser?) This is clearly written as an attempt to humanize the character and give the audience a new way of looking at him, and it’s fairly successful in that regard, but it’s hard not to find any Trapster story at least a little boring. My major issue with the story is the flimsy reasoning for why Trapster is faking his identity in the first place; it’s not like he’s going to be caught doing anything truly evil, and his only technical crime is not informing his parole officer that he’s moved to Los Angeles. And given how important his scientific expertise is to Morrie’s business, it’s hard to imagine that Morrie wouldn’t have arranged for Trapster to work from his home state. This bit of false drama might’ve been intentional on Grobe’s part, admittedly, since he seems to be going with the idea that the Trapster’s problems largely stem from his own self-esteem issues. Rather than telling Morrie the truth and arranging a way to work out of New York, his response to potential exposure is to take a TV studio hostage and commit public suicide. He’s a bit of a drama queen. Kim talks him down, telling him he’s clinically depressed (a nice callback to an earlier reference to her studying Psychology at night), and they share a sweet moment before he’s unceremoniously knocked to the ground by US Agent. US Agent does seem like an odd choice as the hero, but he was located on the west coast at this time, and Grobe seems to be well aware of his role as the Marvel Universe’s jerkiest hero, which is exactly what he needs to be in this scene. 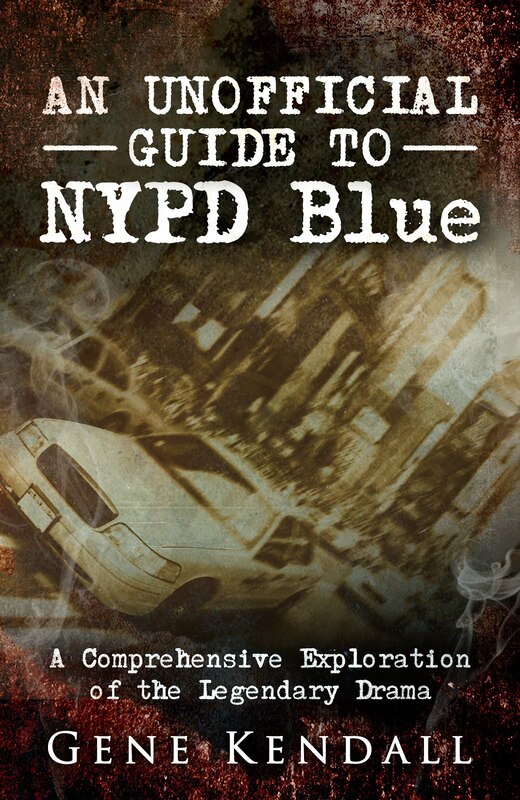 Accepting that the Trapster’s main dilemma is intentionally inflated, the story’s enjoyable enough. It does drag a bit in places, and surely some other character is more deserving of the page count, but it’s a worthy addition to the “Please Take Trapster Seriously” archives. Summary: A retired, unnamed villain sits alone in a diner. He’s barely tolerated by the owner, Grace, and eventually gets up to leave after spending a night reflecting on his past. 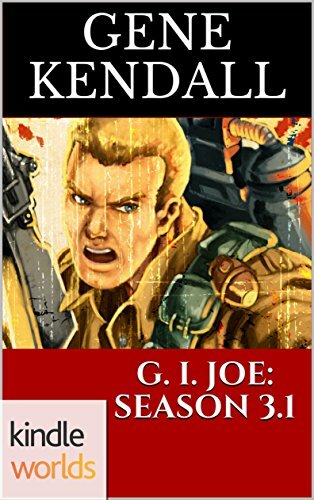 After Grace derisively calls him by his supervillain name, the name he wants to forget, he kills her. He walks into the night, wondering which hero will capture him. Review: The villain of this story is identified as only “?” on the title page, and with the exception of a few references to Captain America and Iron Man, there’s nothing in this story to tie the character to the Marvel Universe. Or to any fictional superhero universe for that matter; the concept could work probably just as well starring any criminal that can’t escape his past. The final story in the anthology, this represents the villains’ point of view, voicing complaints about how indiscriminately hard the heroes hit and how little anyone cares about a supervillain's civil rights. Dawson manages to make the protagonist just sympathetic enough while maintaining a creepy tone throughout the story. This is another entry that could’ve been at home in a modern horror anthology.